Julianne Moore. Dennis Quaid. Dennis Haysbert. Patricia Clarkson. Viola Davis. James Rebhorn. Bette Henritze. Michael Gaston. Drama. Romance. 1950s. Gay Interest. Lulu Loves .... 01 Ade tastics. 01 Mel's Must Sees. Civil Rights. Women on Film. Guardian 1000 Must See (2007). 01 Tara's Midnight Movies. 01 Nigel's Choice. Recommended. A lovingly created homage to the melodramas of the 1950s sees Frank and Cathy Whitaker's picture perfect marriage masking a relationship based on lies. A blossoming friendship with the black gardener and a husband whose fallen in love with another man leave Cathy shunned by her friends and neighbours, her outwardly idylic world finally revealed for the sham that it is. 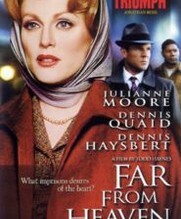 Far from Heaven looks stunning, the recreation of the period nothing short of immaculate, but I have never been a fan of 1950s melodrama and this did nothing to change my view. Everyone else thought it was great mind, so I stand alone......and confused.